Conservation interns Sierra, Luke and Danielle deliver a presentation to several classes in Columbus School. Whale Shark Diaries has been busy! Recently our team visited Columbus English Language School and Colegio St. Johns– two local schools in La Paz, BCS. 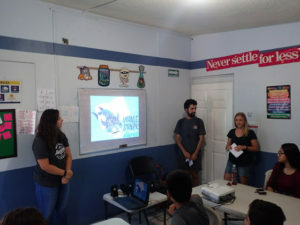 Our goal was to provide the students with some basic information on whale sharks, our project, and the positives and negatives of whale shark tourism. We are excited to share that they were both extremely successful visits. Our presentations include a description of whale shark anatomy, biology, global tourism industry, local tourism industry, and our project focus. At Whale Shark Diaries, we believe that the best method of conservation is through conversation. However, sometimes you need to see it yourself. That’s why we take the next step and invite the students to come and join us on a tour to interact with the whale sharks! Conservation interns Sierra and Barbara delivering a presentation to over 100 students and teachers at Colegio St. John’s. Each presentation we gave allowed us to increase awareness and educate the next generation of locals on the importance of protecting this species. We answered many great questions, all of which helped us to explain concepts of conservation of this endangered species. Thank you Columbus English School and Colegio St. Johns for listening to us, we look forward to seeing some of your students join us on the boat! If you would like us to visit your school in Baja California Sur, please contact us and we will make the arrangements. Blog Post Created By Sierra Rae (British Columbia, Canada), Whale Shark Diaries Intern 2016.